Excerpt from U.S. Coast Guard “Proceedings of the Marine Safety & Security Council” magazine by CDR Kathy Moore, chief, Prevention Department, U.S. Coast Guard Sector Honolulu. In December of 2006, the M/V Tong Cheng departed South Korea bound for the Caribbean via the Panama Canal. Three days into the voyage, heavy weather damaged the fully loaded vessel, flooding its number two cargo hold. Twenty-six officers and crewmembers spent the following three weeks battling the flooding as they crossed the storm-tossed Pacific Ocean. As the situation further deteriorated, they diverted toward Hawaii with plans to make temporary repairs. The vessel’s damaged condition and uncertain stability led the Coast Guard captain of the port (COTP) at Sector Honolulu to assemble decision makers and initiate a unified command to coordinate the response to the stricken vessel using the Incident Command System, as directed by the National Response Plan. The discussions between the inspectors and the vessel crew while the vessel was still offshore were critical to getting good quality information on the vessel’s condition back to the unified command, as well as to salvage engineers responsible for monitoring the vessel’s stability. A dive was made to assess the damage to the port side of the ship. The onboard inspectors were critical in coordinating the dive, as it was necessary to bring the ship to a full stop in the open ocean and tag out every piece of gear or pump that could pose a safety risk to the divers. The amount of coordination was also critical because the dive was performed in an 8- to 10-foot swell, which posed a significant risk to the vessel’s stability if left too long without power in the seaway in its flooded condition. At this point, the unified command engaged with the maritime operational threat response agencies to make arrangements for the vessel to enter U.S. waters and come safely to anchorage. One issue involved hashing out agreements concerning the fate of the vessel’s schedule and cargo as it pertained to U.S. law. The vessel was instructed to proceed to a rendezvous location to meet with U.S. Coast Guard forces for a security boarding. They completed the remainder of the transit into anchorage and the Coast Guard enforced a security zone around the vessel while it was at anchor. While the emergency phase of the response concluded with the ship safely at the pier, inspection and investigation activity began in earnest as cargo was removed from the vessel to inspect for damage and plan and carry out repairs. Of note throughout this evolution was the interagency cooperation that allowed these tasks to take place in the midst of all the appropriate security measures being applied to the ship and its embargoed cargo. 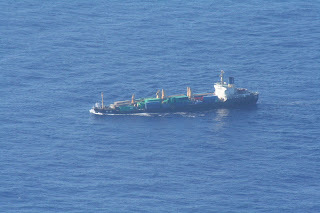 Customs and Border Protection, the Hawaii Department of Transportation Harbors, several Coast Guard marine safety and security teams, and many of the members of Sector Honolulu worked diligently over the next six weeks of delicate cargo operations, damage assessments, and repairs. Sector Honolulu inspectors monitored repair progress daily, working closely with a host of surveyors and officials with oversight responsibilities for the work. Repair plans, cargo loading plans, and amendments were reviewed not only at Sector Honolulu, but also by the Coast Guard’s traveling inspections staff and the naval architects at the Coast Guard’s Marine Safety Center. Over the course of two months, inspectors and investigators from Sector Honolulu contributed to the Herculean efforts of the Coast Guard and other members of the unified command in one of the most complex responses to a vessel in need of assistance. As a result of sound risk-based decision making and hard work by a host of personnel, the M/V Tong Cheng was able to get underway and return to her departure port. In the process, 26 lives were saved, 140,000 gallons of fuel did not enter the pristine marine ecosystem of the main Hawaiian Islands, and the effort’s success contributed to good will between the U.S. and People’s Republic of China. Online survey available at: http://www.uscg.mil/proceedings/survey.asp.